The more I think about the San Francisco Marathon, the more I think it’s a bad idea. Perhaps I’ll run the half marathon. 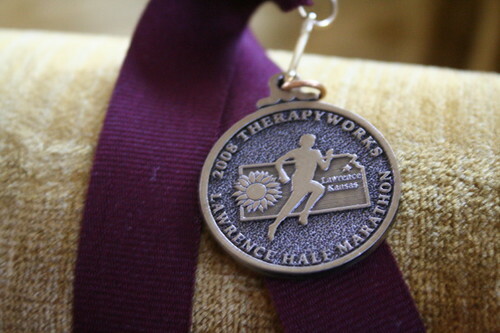 I could aim for a better, faster race instead of slog my way through 26 miles. A few of you mentioned that you’re running too, which I think is fabulous! I fully support the runner’s high addiction. 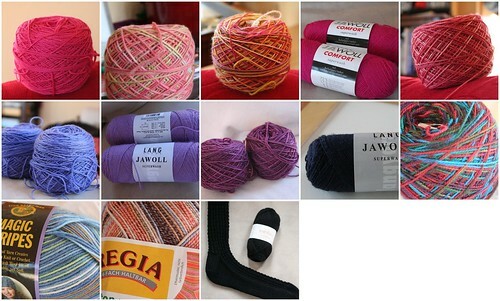 And let’s not forget the yarn addiction! I think we should all get together and run a nice half marathon in a city with great yarn shops. It would be the perfect marriage of two dangerous hobbies! 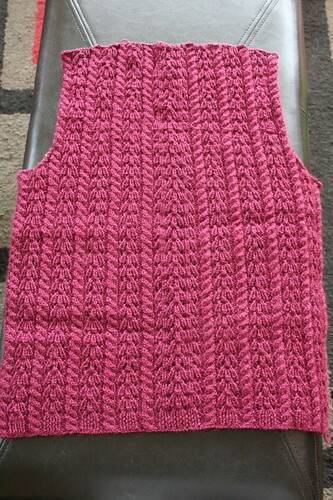 Progress on the knitting front has been less than perfect, however. 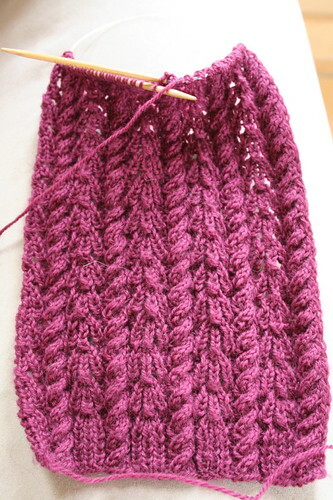 I’m almost to the armholes on one of the fronts of the Katharine Hepburn Cardigan. 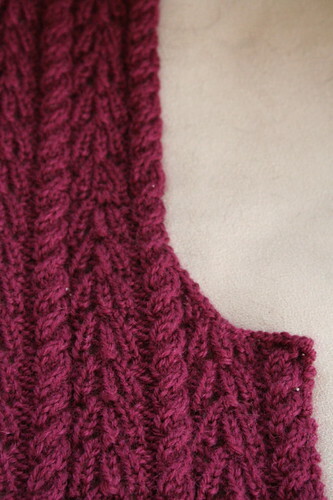 I look forward to the other half of the front because all of the cables will go the other direction, which I find easier to do without a cable needle. While knitting the other day, I found myself wondering about why the yarn cake deforms the way it does. I’m pulling yarn from the left in this picture but as I pull out the innards of the cake, it bulges to the right. Why is that? I would expect it to explode in the direction I pull. Anyone? Erin? Adam? People who know physics? You now know what absurd things I think about as the semester draws to a close. I’m studying for finals and the MCAT but hey, what’s up with my yarn cake? I am easily distracted at the beginning of May. Lastly, once I realized that I was on track to complete one pair of socks per month, I decided that I had to cast on for a mindless stockinette pair for my May socks. I actually started these weeks ago but there has been a shocking dearth of knitting around these parts so they are only now making an appearance. I cast off the first one this afternoon and I’ll probably start the second one later this week. 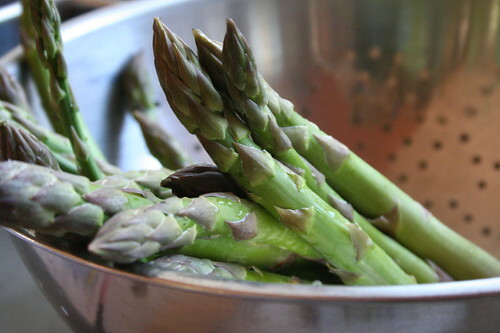 While my knitting seems interminably stuck in the pinks and purples, locally grown asparagus adds a nice splash of color to my day! If only my tomato plants would GROW! It is so hard to pick out tomato plants at the nursery because each variety is supposed to be the BEST TOMATO YOU’VE EVER TASTED. I may have planted close to 20 plants. I have no willpower when it comes to the best tomato ever tasted. Thank you for your many insightful comments and observations about my last post. I will entertain the possibility of a regular summer open house, garden permitting; however, I think Amy is right in pointing out the danger of trying to recreate something from one’s youth. Still, Wendy and Nova and Ann have found ways to make open houses work. And Zarah pointed out that Kelli frequently hosts community suppers – Kelli’s suppers were what made me think a common meal could work. Nevertheless, you all brought up interesting points and I appreciate your thoughts. Let’s continue a discussion about this in the community we share: the knitblogosphere! Let’s move on to the knitting! I have been working on some old projects lately, adding more length to my Drunken Bee sock and finishing up the back of my Katharine Hepburn cardigan. I started this one last fall but I set it down because the stitch pattern is both mindlessly dull and impossible to knit while reading. Nevertheless, I love how it looks! The pattern is from Lace Style (Ravelry link here) and the yarn is Brown Sheep Nature Spun Sport in “Chuck Berry”. Taking stock of my recent projects (this sweater, my Newburyport socks) and my remaining sock yarn stash tells me that I have a color problem. Specifically, I have a problem with pinks and purples. Who knew? I always thought my favorite color was blue! 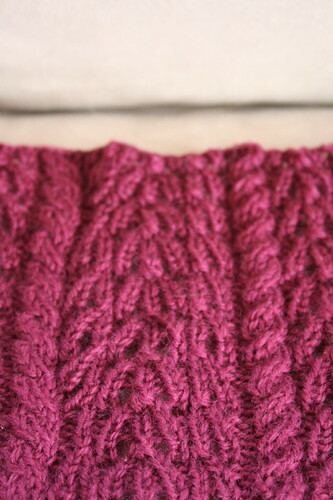 Needless to say, there will be a lot of pink and purple knitting coming your way in the coming months. I will certainly return to blue and green yarn once this stash is exhausted. 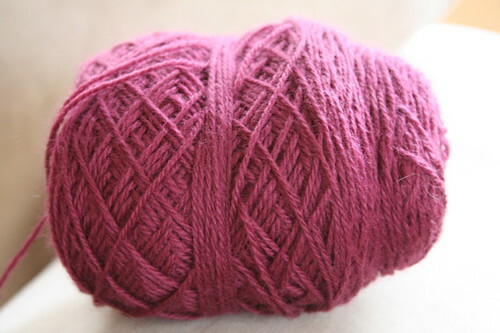 In the meantime, what does one do with 4 oz of Cherry Tree Hill sock yarn in BRIGHT PINK??? And speaking of that sock stash, it is down to 13 pairs worth of socks (from 21). I used up four pairs and traded away almost all the Knit Picks. This is what remains. There is hope! Finally, in an exercise bit of news, I finished my second half marathon yesterday and cut about 22 minutes off my time (largely for lack of desperate porta-potty stops). I think I ran about a 9:30/mile pace but I had to walk mile 11 because I got bad cramps. In the end, I think my time was around 2:11. It would really be nice to break 2:00 next time around! I’m thinking about running the San Francisco Marathon in August but I’m pretty much scared witless. Any opinions? Do any of you lovely knitters want to run a marathon this summer/fall? Tell me all about it! I need to be talked into this one. Just after Beatrix was born, I bought a skein of J. Knits Superwash Me Light Sock yarn in the Newburyport color. It was most certainly an impulse buy, driven both by post-partum boredom and nostalgia for the time I spent in Newburyport as a teenager. My boarding school was a few miles outside of Newburyport and the school ran Saturday morning vans into town. I’ve been thinking a lot about the old school lately, in part because my 10th reunion is coming up this June but there’s more to it. I must say that my greatest disappointment with adult life is the incredible lack of community in my life. By this, I do not mean friends. I mean community. Let me explain by telling you a little bit about this school. Every Saturday night, the headmaster and his wife would open their home to students, faculty and faculty families. There were pool and ping pong tables in the basement, a game or a movie on the television in the den, an informal chess tournament, lots of board and card games and a piano in the living room and a bridge game at 9 p.m. The food was a teenage treat as well: ice cream, chips, nachos and all the soda one could consume. There may also have been weekly bets as to whether my freshly charred baked chocolate chip cookies would bring the fire department but that is a story for another day. Nevertheless, Open House was a chance for people to relax after a grueling week, to catch up with friends and to spend time together. Looking back on it, some of the most important lessons I have learned came from Saturday Open House. At the time, I valued being with friends. What I think is even more valuable now is the time I spent with people who were not my friends: faculty, acquaintances and even declared enemies! I think it is a very humanizing experience to sit around a table with people who are not close friends and have frank, honest discussions about life, the universe and everything. In fact, I believe these sorts of encounters formed the basis of the school’s strong community spirit. They are most certainly what I find lacking in my life today. Would it even be possible to recreate Open House in a non-campus environment? I have my doubts. Most likely, it would involve cars, planning and the Midwestern bringing of casseroles – in other words, it would be just another party. A community supper might be another idea – and one that my garden could support, at that. I wonder if a supper could ever reach a critical mass, however. Still, neither is the same as walking in your neighbor’s back door, kicking off your shoes and grabbing a bite to eat before jumping into a bridge game. What do you think? Do you keep any community traditions? Is Open House worth trying to recreate or is it something that should be left alone? Discuss! Oh yeah, socks. 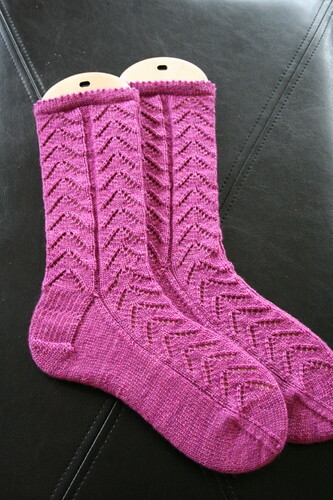 They’re done, I’m happy with them and you should all go buy J. Knits. Specs below. 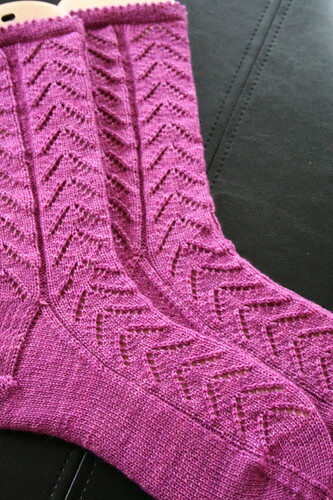 Even though these were knit on size 0s, I loved knitting these socks! The yarn was just wonderful. I have enough yarn left over for another knee sock! 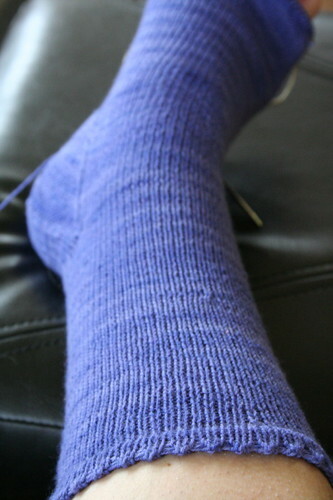 J. Knits = great yardage for big feet.